In July 2017, Kemal Kılıçdaroğlu, the 69 year-old leader of Turkey’s main opposition party, the Republican People’s Party (CHP), completed a 450-kilometer ‘Justice March’ from Ankara to Istanbul, which drew hundreds of thousands of participants. Seven years after his first interview with TPQ, we sat down again with Mr. Kılıçdaroğlu to discuss the ‘Justice March’ and the state of affairs in Turkey. 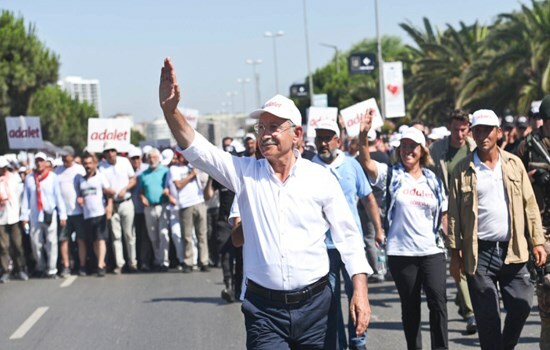 Reflecting on the march, Kılıçdaroğlu explains that it marks a turning point both in CHP’s evolution and in Turkey’s political history, as it has sparked hope for the country’s opposition. In his remarks, Kılıçdaroğlu stresses the importance of restoring the rule of law, ending the state of emergency measures, and strengthening the democratic parliamentary system. In July 2017, you completed a 25 day, 450-kilometer ‘Justice March’ from Ankara to Istanbul. Could you elaborate on what made you decide to do this march? What were your goals? I believe that the ‘Justice March’ is a turning point in Turkey’s political history. You are making a mistake. There is a ruling from the Constitutional Court. Members of parliament may be tried but not arrested. You are obligated to comply with the ruling of the Constitutional Court. You must defend members of parliament because you are the Speaker of Parliament. The Speaker of Parliament assured me that he would obtain an opinion from constitutional lawyers. However, he did not do so – members of parliament still remained in jail. The straw that broke the camel’s back was the arrest of Enis Berberoğlu. There is no longer democracy or justice in the country, one of the fundamental reasons for this being the erosion of the justice system. If the justice system is being used as a political weapon or as a primary tool to liquidate the opposition, then there is no democracy. This was the fundamental reason for the decision to march to Istanbul. Ultimately, the Appeal for Justice is a debate about the independence of the judiciary. There can be no democracy without the separation of powers, freedom of the press, and a parliamentary democratic system. These are absolutely critical. Do you think it is possible that your demands will be met any time soon? No. Upon completing our march, did the ruling party sit down and critique their own policies or conduct an internal review to understand why a protest march materialized? No. Why not? Because the leader that is ruling Turkey is not an actor/person who comes from a culture of democracy, but rather from a culture of imposition and submission. If the leader had roots in a culture of democracy, he/she would at least question this march from his/her own perspective. This actor/person would say, “We must have a deficiency somewhere, these people must not be marching 450 kilometers for nothing. There is something wrong here.” If something similar to the ‘Justice March’ took place in the UK, the US, Japan, Germany, or France, their leaders would certainly have addressed their societal grievances. Our march, on the other hand, is a march against a wall. Therefore, our goal is to tear down the wall and cross over to the other side. We marched and the ruling party remained seated. Will they reconsider? No. But I know that we created a serious problem for them. Did this march get the international attention it deserved? CHP is the only actor left that can speak up. We made the decision to march one afternoon at an extraordinary Central Executive Committee meeting. Originally, I had decided to march on my own, but the crowd I met yearning for justice was much larger than I imagined, and the proportions of the march grew beyond my expectations. Along the entire 450 kilometers between Ankara and Istanbul, there are only two mayoral districts held by CHP – one leaving Ankara and one entering Istanbul – the rest are controlled by AKP. As a result, it was a difficult route. There was also much more attention in the international arena than I expected there to be. At the onset, international observers may have thought that the march would not take place or that it would fizzle out, but the fact that the march only grew larger caught the attention of the international media. I think there were more than one thousand articles, columns, and news stories, which we are now trying to compile. Overall, I am pleased with the attention in the international press. The political activism of marching marks a break from the conventional tactics of opposition CHP has employed in the past. What led you to change your strategy? If a party’s political discourse is just “talk” and if you are unable to relay your message to a broader audience, a novel approach must be taken. Currently, at least 90 percent of the Turkish media is controlled by the ruling party, and no matter what we say, we will be unable to reach the masses. If you try to hold a rally, what will happen? You have a two-hour demonstration and then it ends, with television stations covering it for one or two minutes, at the most. But if you walk for 25 days, and if you are setting the agenda in Turkey for 25 days, then it will have a much larger impact and a greater effect on society. It is also critical that one continues to march with determination, resolve, and resistance, in spite of all obstacles. In this respect, I believe that the ‘Justice March’ is a turning point in Turkey’s political history. What impact will it have on society? We may not be able to see that in the short-term, but I think we may be able to see its impact on society over time. So, does this signal a new approach in CHP’s political strategy? Justice is not just for CHP and its supporters. It is a universal concept that applies to every segment of society and a fundamental principle shared by all faiths. Yes, and the reason is the following: At present, the government is focusing its entire strategy on destroying the opposition with its state of emergency practices. The Parliament has its own bylaws, which the government is trying to change so that the opposition is effectively quashed. For example, the government controls the media and the judiciary. Civil society organizations are afraid to speak up and universities have already been silenced. When civil society organizations try to voice their concerns, their leaders are punished in some way by linking them to terrorism; they are criminalized. Turkey needs a body that will lead and express the suppressed feelings of society in some way. CHP is the only actor left that is able to speak up. CHP is the party that brought democracy to this country; the party that consistently defends democracy and encourages a pluralistic society. CHP says, “Democracy is for everyone.” We know that in this regard the march at least inspired confidence in many segments of society. It cemented the feeling of many who now think, “I am not alone. There are millions of others who think like me.” That is a positive development. Could you comment on the participation of women in the march? And more broadly, does CHP have a specific strategy for empowering women? One of the things that caught my attention on this march was the presence of women both during the march and at the demonstrations. In Maltepe, I had never seen that many women at a rally before. In the past, women were sparsely represented. This time however, women stood scattered throughout the entire area. This is a very positive development. At rallies, we can really sense that women understand and realize the cost that regime change will entail. CHP has the highest gender quota in Europe with 33 percent (compared to 30 percent in some European countries.) For example, we put a contingent of women at the top of every list in Ankara, Istanbul, and Izmir – even I was listed in second place. It is of utmost importance for women to be involved in politics. We also have a youth quota of 10 percent. This is really crucial. One of the leading Kurds, Ahmet Türk also participated in the march for justice. Does the fact that Kurdish politicians joined the march indicate that CHP could work with the Kurds in the future? Our goal is to work with the Kurds; they are just as much a part of this country as I am. I do not have a monopoly on patriotism. We were, of course, delighted to see Ahmet Türk standing by our side. He wanted justice too; that is why he came. The Association of Kemalist Thought was there. The nationalists were there. They want justice too. Justice is not just for CHP and its supporters. It is more than just a legal concept; rather, it is a universal concept that applies to every segment of society and a fundamental principle shared by all faiths. A prerequisite for all of us to live in peace is to believe in and strive for justice, even if our opinions differ. Therefore, we have no problem with the Kurds. 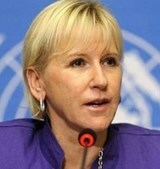 On the contrary, our goal is to work with the Kurds; they are just as much a part of this country as I am. I do not have a monopoly on patriotism. I view everyone who lives in this country as a patriot. We are obligated to communicate with every segment of society. Are there any anecdotes from the march that you could share with us? A woman, about 90 to 95 years old, wanted to approach me on the outskirts of the town of Gerede, which is a district of Bolu province. When the police prevented her from doing so she said, “I have been waiting here since the morning for Kılıçdaroğlu.” The woman put her arms around me and said, “I want to walk with you.” So, we walked together for a while. Yet, Gerede is the district where we received the fewest votes. On another day, a young man came up to me and told me that his father was a former AKP parliamentarian, but that he himself was a member of the Republican People’s Party. He said he supported our march for justice, which was why he had come. There was also a young couple who brought their two-month-old baby to the march; I will never forget the cute photograph I took with that baby. İzzet Baysal’s brother, who founded İzzet Baysal University and devoted significant resources to education, and his wife, came and walked with me. They are both in their 90s. When returning to Maltepe via the E5 highway, I was shocked at what I saw when we came up on the bridge heading for Maltepe: a crowd so large that you could not even see the last person. That was one of the most beautiful sights of the march. It was a little over a year ago when Turkey’s four main political parties laid down their political differences and presented a united front against the failed coup attempt. What has changed since then and do you think Yenikapi Ruhu (the spirit of Yenikapi) still exists? Keep politics out of the mosques, the barracks, and the judiciary. The spirit of Yenikapı died the next day. Let me explain what ended it. The other political actors who spoke at Yenikapı served up the classic political narrative we are familiar with, but my speech at Yenikapı was different. I listed 12 things that needed to be done to make sure Turkey does not face coups in the future. At the top of the list are: Keep politics out of the mosques, the barracks, and the judiciary. There must be a merit system in the state; the judiciary must be independent; the democratic parliamentary system must be strengthened; there must be gender equality; and the rule of law must prevail. I emphasized that the political parties’ law should change and the unstoppable power of political leaders had to end. I added that coup law must be eliminated from Turkey. I listed 12 principles. Upon finishing my speech and returning to my seat, President Erdoğan stood up and congratulated me. However, which of these was actually implemented? Not a single one. Rather, it was the exact opposite. The judiciary used to have a limited and faltering independence, which is now completely gone. The democratic parliamentary system has disappeared entirely. Turkey has been pushed towards an authoritarian regime. Freedom of the press has completely disappeared. There are more than 150 journalists in jail right now. As for gender equality, the reality of the situation is that the person sitting in the palace does not accept gender equality anyway. Not a single one of the essential, fundamental principles that I listed in my speech has been implemented. Regardless, I am still emphasizing these main principles today as I did one year ago. I talked about the independence of the judiciary that day, and I am still talking about it today. I talked about the democratic parliamentary system that day, and I am still talking about it today. I raised the issue of freedom of the press that day and I said journalists cannot be thrown in jail. I am still saying that the state cannot be managed with anger, grudges, and the desire for revenge. The state must be run according to the rule of law. Trials must be conducted according to the rule of law. But the government is doing the exact opposite; they see everyone as an enemy. What are your views about Turkey’s education system? CHP has established amicable relations with all segments of the society; we became the voice for excluded segments of society. To hold a country back, there is only one thing you have to do: fiddle with the education system. If a country’s universities are not producing knowledge, society cannot look with confidence toward the future. Universities must produce knowledge so that Turkey can be a country that contributes added value. Today, universities in Turkey face extreme pressure. They are not free to express their opinions and more than 1,000 university faculty members have been fired. This is absolutely unacceptable in a country that is supposedly democratic, and only happens under an authoritarian regime or in a country which is ruled by the military juntas. Turkey has lived through this before. 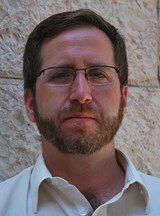 We witnessed meddling in the education system in the aftermath of the military coups of 1971 and 1980. The country experienced mass university personnel layoffs under Law 1402, which introduced martial law in Turkey. Today, the situation is similar. The constitution has been de facto suspended with current executive orders, and the authority of the Parliament has been de facto usurped. Even the Constitutional Court is afraid to issue rulings about the members of Parliament under arrest. Still, the current situation is more alarming. During previous military coups, there were martial law courts and rulings were based on evidence in the case files – whether they were just or unjust. During the the Sledgehammer-Ergenekon trials, rulings were based on falsified evidence. It was fabricated, but there was still some evidence in the files. Turkey experienced a civilian coup after 20 July 2016, and today’s case files do not even contain any evidence. But people are still being detained and arrested. The most typical example is the two Sözcü reporters. The judges said, “There is not enough evidence in the file. They will remain under arrest so that evidence can be gathered.” This is irrational. This is also one of the most typical examples of why our march for justice attracted so much attention and support. Privates in the armed forces who had only been in the service for three days are still in jail on charges of being involved in the coup. A private who has only been in the army for three days still has not been issued a weapon. Throwing these people in jail on charges of being involved in the coup is simply unacceptable. But those who provided all types of support and entrusted state agencies to FETÖ up until late 2012, including highly sensitive information, are currently in power. In your last interview with TPQ in 2010, you had just become head of the party and talked about the strategy of the “new CHP.” Can you reflect on how CHP has evolved over the last seven years in tandem with the political environment? CHP has established amicable relations with almost every segment of society, some of which were initially wary of our party, but ultimately began asking for our help. This is very important for us. CHP has also established very friendly and sincere relations with excluded segments of society, including subcontractors, retirees, villagers, and seasonal agricultural workers. I have tried to foster dialogue and be a voice for their problems. There was also a perception by the public that CHP criticizes but does not offer solutions. With the Central Turkey Project, for example, we studied how the depopulated Central Anatolian region could be revived and enriched, and how per capita income could increase to 25,000 dollars by 2035. We created an economic database complete with all of the details and shared these with the public, explaining our plans for each segment of society. We no longer hear the criticism that CHP does not explain what its future plans are. On the contrary, many circles now recognize that today it is CHP that is producing the best solutions for the future of Turkey. Looking to the future, are you hopeful about what is in store for Turkey? The constitutional referendum was a clear indication of the Turkish peoples’ will to fight for democracy. All of the resources of the state were leveraged; its money was spent. The bureaucracy was utilized, as well as the state media, and still, the ruling party could not garner 50 percent for the ‘yes’ vote. The referendum was called as a ‘yes’ vote only because of the the Supreme Electoral Council’s decision. Nevertheles, I have never despaired. I am hopeful. In 2019, we will replace the current leader. I do not have the slightest doubt about this because I trust the common sense of the people. The current state of affairs is unsustainable and the country cannot tolerate it much longer. I do not think that Turkey will continue to support a repressive regime for long because it has fought for democracy and has paid a steep price to achieve it. * This interview was conducted by Assoc. 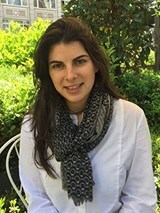 Prof. Zeynep Alemdar, Founder of Women in Foreign Policy Initiative and an Editorial Advisor of Turkish Policy Quarterly (TPQ), and Editor in Chief of TPQ, Süreya Martha Köprülü. 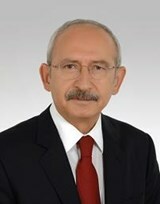 Kemal Kılıçdaroğlu is the leader of Turkey’s main opposition party, the Republican People’s Party (CHP).